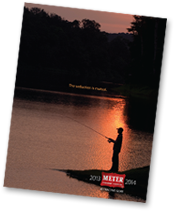 Welcome to Meter Fishing Tackle. For over 50 years we’ve been designing and producing the finest fishing tackle for everyone from the experienced angler to the first timer. Our wide selection, including Meter’s Original Bottom Bouncer, provides the right equipment for those on the hunt for a trophy fish or just a relaxing day on the water. Every one of our products features the highest quality materials and workmanship to ensure a great day at your favorite fishing spot.